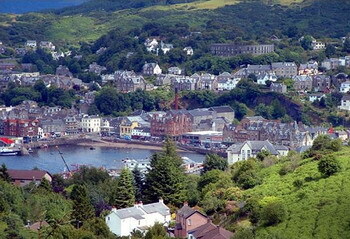 Oban, which translates in English to “The Little Bay,” is a charming resort town located in the Argyll and Bute area of Scotland. Popular during the summer months, the town is located in a scenic setting in the Firth of Lorn and sits on an almost perfect horseshoe of a bay, protected by Kerrera Island, and further out, the Isle of Mull. Even though the town is small, it is still the largest town to be found between Glasgow and Fort William. There is so much to see and do in the area, and when staying in comfortable self-catering accommodation at Bonawe House located in a scenic and lovely area near the nearby village of Taynuilt, you are in the perfect spot for some sightseeing. Those interested in history, can head to the Oban War and Peace Museum, which aims to educate present and future generations by displaying and conserving cultural and historic items related to both peace- and wartime years. Interestingly the museum operates in the Oban Distillery, close to the main seafront in the town. Apparently the distillation of whisky actually predates the town of Oban as production has been happening on this site since 1794. 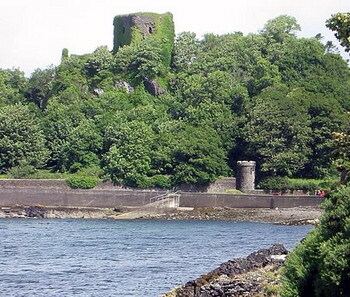 Dunollie castle near Oban CC-by-SA Hartmut Josi Bennöhr For evening entertainment the Corran Halls Theatre offers community events along with various theatrical and musical events, including hosting the Scottish Opera. The town’s Phoenix Cinema offers a selection of the latest films on offer and it is interesting to note that Oban has starred in several films itself, including Morvern Callar and the charming, although rather sad, Ring of Bright Water. For those preferring other dishes, there is an excellent range of restaurants offering various menus in the town centre. For a pub lunch and a pint, there are several excellent pubs available as well as several local micro breweries. For those in a shopping mood, Oban offers a wide range of stores selling clothing, shoes, household items, as well as gifts, souvenirs and local craftwork. George Street is the main shopping area of the town and strolling down the street window shopping takes a visitor down past the bay itself, with excellent views across to Kerrera island and the ocean beyond, to Argyll Square, offering more cafes and shops. Leading off the main shopping street are several lanes worth exploring for more quaint retail therapy experiences. It is important to note that Oban is a Fair Trade Town, offering a better deal to third world producers and several outlets in both Oban and the surrounding area stock Fairtrade products.